Un programma efficace e gratificante per il duro lavoro di ogni membro. We basically offer a Direct Sales Commission, a Binary Commission for building 2 teams and a Matching Bonus Commission for helping others build 2 teams. We top these bonuses up with a Vizionary Leader Bonus for those that build big and deep. *As of Dec. 3, 2018 the content of each Package is based on the live and actual price of OGC on Huulk and the actual token price on the token platform. 65% of the content will be given as OGC and 35% Token Shares, escrowed for 12 months. **As of Jan. 22, 2019 the content of each Package is based on the live and actual price of OGC on Huulk. 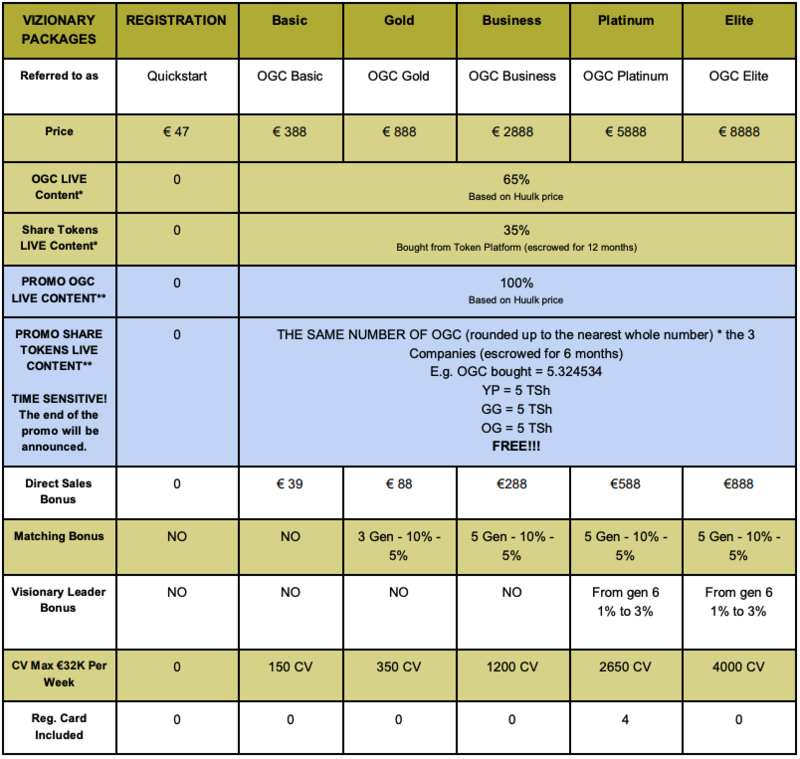 100% of the package price will be given as OGC. Token Shares will once again be given FREE, escrowed for 6 months! If you would like to learn complete details regarding our commission plan, keep reading. First, a very important point: To earn commissions, there is no weekly, monthly or yearly requirements/activity from you. If you sponsor people, you get paid – when your teams work, you accumulate CV and earn Matching Bonuses, regardless if you personally purchase any products from Vizionary or not. In other words, there are no auto-ships, etc. Direct Sales Commission is very simple. You earn 10% commission based on the price of the package you refer. Binary Commission, is a bonus which is paid for building a two-sided team structure. In your back office, you will see a binary tree where you place your new associates. 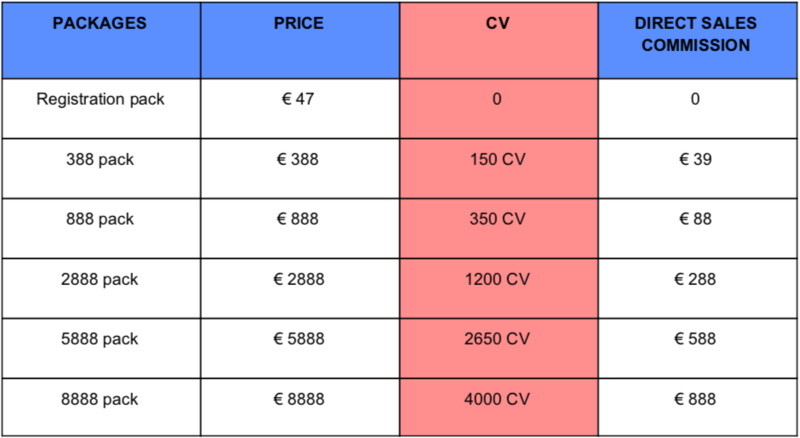 Every time you or someone else places a CLIENT below you, in your binary tree, down to infinity, you will receive points that are referred to as CV (Commissionable Value). Points that do not get processed for the week's commission run are saved to future calculations. However, points that are not processed within 52 weeks / 360 days will be deleted with the oldest points always being processed first. There is an overview of this in your back office. Your commissions are paid out as steps - or “pay-cycles” and each 1 step has a different value, depending upon your recognition level. There is a ONE TIME ACTIVATION (OTA) you MUST complete, to earn a full Step Value. You MUST personally make sales in each of your binary legs, earning at least 200 CV in each leg. Until you do so, your Step Value will be €20.00. 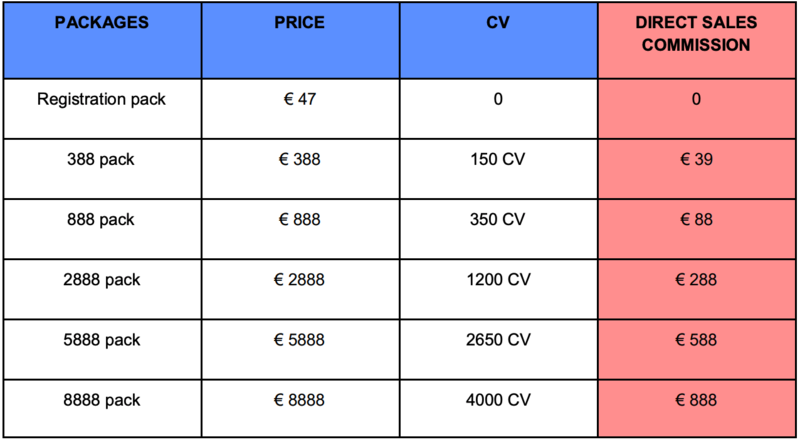 Here is how this rule applies: You must complete OTA within 30 days (from your date of activation) so you can get paid a full step value of €50 per step. In the first 30 days, all CV will be accumulated if you haven't completed the qualification. As soon as you do it, next commission run will give you a payout based on all your accumulated CV so far. If you haven't completed your activation after 30 days, the system will make you active anyway, but then all your steps will be paid out as 20 Euro per step and it will keep paying you 20 Euro per step until you complete your OTA. SO - One Time Activation is something you can choose to complete anytime even after 30 days have passed. Weekly Cap refers to the maximum you can earn in a given week from your network team commissions. To cap means that the points you weren’t able to use (in both legs), if any, will be deleted since you maxed out your earnings for that week. Remaining CVs earned will be deleted/flushed. Note: The Vizionary commission system automatically identifies and displays one of your legs as your Power Leg. This is the leg where you potentially get help from above. The opposite leg is your Working Leg. How does a pay run function? First, it calculates all your steps based on the recognition level you had starting last week. After the payout, the system checks if you have reached a new recognition level and if so, it updates your status for the next payout. In other words, even if you reach a new title halfway into a week, the upcoming commission run will be based on the status you had going into the week. 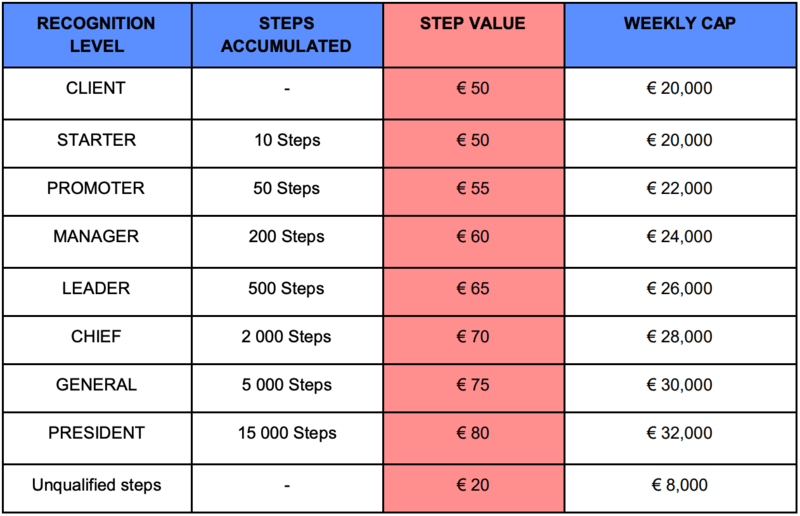 There are 2 scenarios from which one can earn unqualified steps and in both scenarios, one unqualified step pays € 20 per step. Scenario 1 - You didn't complete your OTA of the binary within the first 30 days when your commission is paid out. If you want to change this, just complete your OTA and in your next pay run, you will receive the applicable step value for your recognition level. 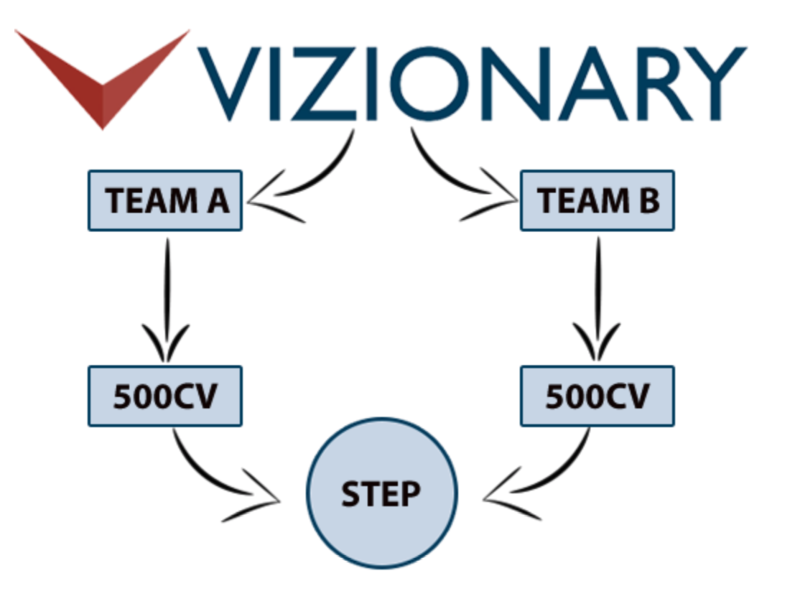 Scenario 2 - Vizionary’s Binary commission plan is designed to make sure that no one can achieve full success without having to continuously contribute to growth on both the left and the right side of their business. You can get unqualified steps if you focus on building only your Working Leg. There is a balance rule and this is how it works. Of the points you earn in your power leg (and this rule only applies to your system set power leg), 100 CV of 500 CV, needs to come from your Personal Team. Personal Team means in this scenario members that can be traced back to you through generations. It doesn't matter how many generations away from you these CV points are produced. Basically, for every step you earn, you need to have 100 CV from your Personal Power leg team (tracked down to infinity). You did not earn 100 CV from your Personal Power Leg team in every step. But only 500 CV was earned from Personal Power Leg team. The personal power leg team qualification points are reset to zero on a weekly basis. 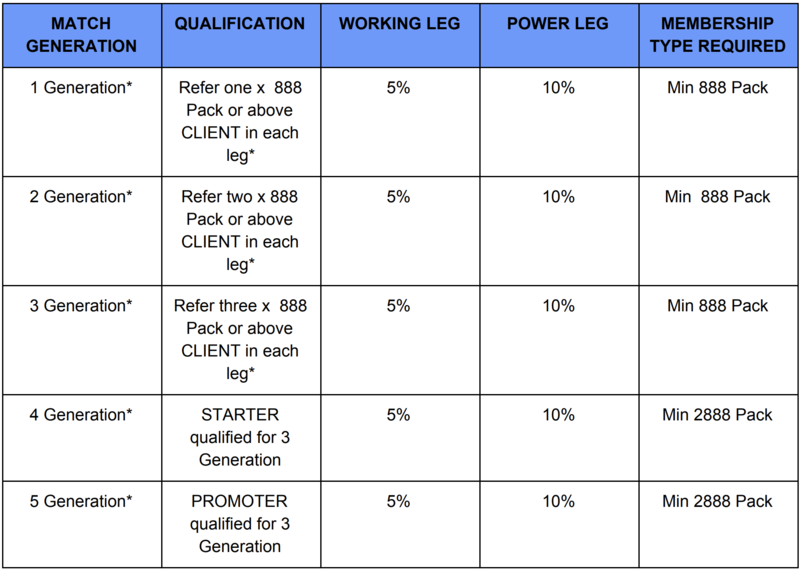 DO NOT confuse the personal power leg team qualification CV with your unused Binary CV points. Unused Binary CV will remain intact until they are paid out, maxed out, or expired. The only thing that is reset every week is the QUALIFICATION. Matching Bonus (MB) is an awesome bonus Vizionary offers. This bonus rewards you for helping people in your personal generational structure to earn binary income. Personal Qualification: Must have personally bought at least an 888 Pack or above. Sponsorship Qualification: Personally sponsor at least an 888 pack or above to each of your legs. Position Qualification: Place sponsored packs on the outside legs of your network structure. *When qualifications are met, you will earn a matching bonus from everyone in these generations, regardless of their membership type and where they are placed in your structure. Vizionary Leaders Matching Bonus (VLMB) is an extraordinary bonus that can only be achieved with dedicated work and excellent results. This bonus rewards you for helping people in your personal generational structure to earn binary income, just like the Matching Bonus mentioned above, but in this case even deeper into your team structure. Personal Qualification: Must have personally bought a 5888 Pack or above. Recognition Level Qualification: CHIEF or above.